Result: -the abolition and replacement of French king, aristocracy, and church with a democratic republic. Became more militaristic and authoritarian. Based off of Enlightenment principles of citizenship and inalienable rights, as well as nationalism and democracy. 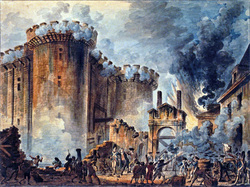 The revolution also brought Napolean Bonaparte to power. Women, just like the Russian, Chinese, Cuban, and Iranian revolutions, had virtually no political rights; they could not vote or hold any political office. They were forced to rely on men to determine what was best for them in the government. The Encyclopédie, published over the years 1751–1777, even went so far as to say a woman was a "failed man," the fetus was not fully developed in the womb. When the Revolution broke out, women used the volatile political climate to assert their active natures. Women could not be kept out of the political sphere during the revolution; they swore oaths of loyalty, "solemn declarations of patriotic allegiance, [and] affirmations of the political responsibilities of citizenship." Women such as Pauline Léon and her Society of Revolutionary Republican Women fought for the right to bear arms, used armed force and rioted. This was very similar to the beginning of the Russia Revolution, where women were very active in helping overthough the tsarist regime. Just as women in the French Revolution took up arms against the aristocracy, many Russian women joined the army and female combat units were created. Though women did not gain the right to vote as a result of the French Revolution, they still greatly expanded their political participation and involvement in governing. Whats going on: Tunisian President Ben Ali ousted, and government overthrown. Egyptian President Hosni Mubarak ousted, and government overthrown, continued popular protest again military provisional government. 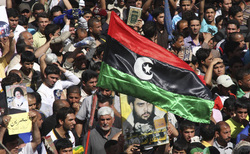 Libyan leader Muammar Gaddafi killed after a civil war with foreign military internention, and government overthrown. Yemeni President Ali Abdullah Saleh ousted, and hands power to a national unity government. Syria experienced Uprising Protests and armed conflicts between the Regime and the opposition forces. Civil uprising against the government of Bahrain. 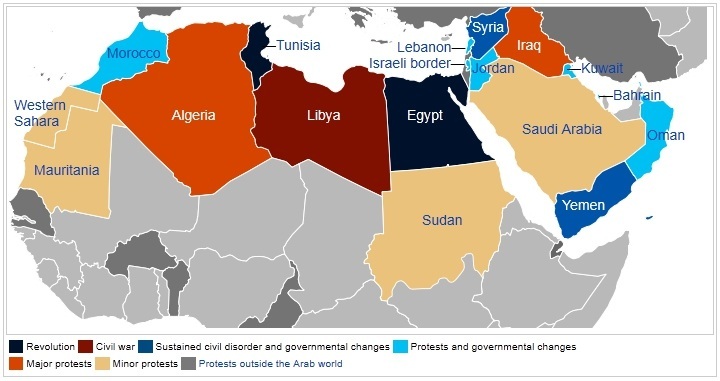 Kuwait, Lebanon and Oman implementing government changes in response to protests. Morocco and Jordan implemented constitutional reforms in response to protest. Ongoing protests in Algerai, Iraq, and other countires. Women in all of these countries were oppressed, much like the earlier revolutions. With the Arab Spring, women are able to gain many rights they did not have before. Although many women still have not gain full equality to men, it is a step in the right direction. In Saudi Arabia, King Abdullah announces women's approval to vote and be elected in 2015 municipal elections and to be nominated to the Shura Council. So just like in the Russian Revolution, women in some of the countries were gained the right to vote. The leading Islamist party, Ennahda, won over 40% of the vote, and managed to elect 42 women to the Constituent Assembly. Tawakul Karman was awarded 2011 Nobel Peace Prize for her role in supporting women rights and involvement in the Arab Spring. As a result of the revolutions, both present and past, women are able to gain more political authority, and finally have a say in their country's goverment. chador in public, including news anchors on television. Women who refused could face public whipping and prison time. (Mir-Hosseini 42) Rather than having to go to court, men could once more simply declare "I divorce you" three times to dissolve their marriages; women, meanwhile, lost all right to sue for divorce. Still today, women in Iran continue to face weaker rights today than they did in 1978. It takes the testimony of two women to equal the testimony of one man in court. Women accused of adultery have to prove their innocence, rather than the accuser proving their guilt, and if convicted they may be executed by stoning. So while most revolutions allowed women a greater status, the Iranian Revolution oppressed women even more.